MOVILLE musician and songwriter Leo McCauley is tuning up for the launch of his debut CD tomorrow night. Leo and his six-strong band will be supported by a number of musician friends for what promises to be a special night of entertainment in the local Caiseal Mara Hotel. Moville-born but living in neighbouring Greencastle, Leo is well known as a local estate agent. But when he's not selling property, the father-of-five devotes much of his spare time to his passion for music. He is a regular feature on the local singer-songwriter and open mic circuit and he was among the artists on the bill at the inaugural JewelBox Festival at Carnagarve House this summer. Leo, who sings, plays guitar and harmonica, is known for a style of music that combines catchy melodies with personal and heartfelt themes. He has also been a member of Moville Gospel Choir since it began seven years ago. The local man issued an open invitation to everyone to come along and help him celebrate the launch of his first CD entitled 'The Man Who Burst the Bubble'. 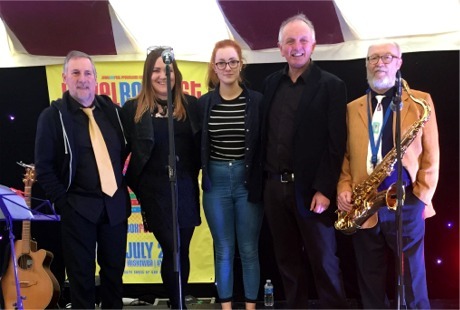 Leo McCauley, second from right, pictured with some members of his band who will take to the stage for the launch of his debut CD 'The Man Who Burst the Bubble' on Friday, September 9, 2016. It will be held in the seaside hotel's main function room and will be set out in an intimate bistro-style setting. “I have a few friends supporting me on the night. Martin Moir opens up proceedings at 10pm followed by The Teraways, members of Moville Gospel Choir and Broken Hearted Horses. "My band is comprised of George McCormick, guitar; Marianne Ashcroft, bass; Patricia McLaughlin, vocals; Gerard McGonagle, drums; Kate McCauley, keyboards and Gerry McNelly, saxophone." The event will take place in the Caiseal Mara Hotel, Foyle Street, Moville, on Friday, September 9, with the first act due on stage at 10pm. Admission is free and everyone is welcome. "Hopefully an enjoyable night will be had by all," added Leo.